I hope you enjoyed yesterday’s filler. Sorry these past few days have been weird… me and Victor have had an eventful weekend. He’s worried he’s gonna lose his other eye. 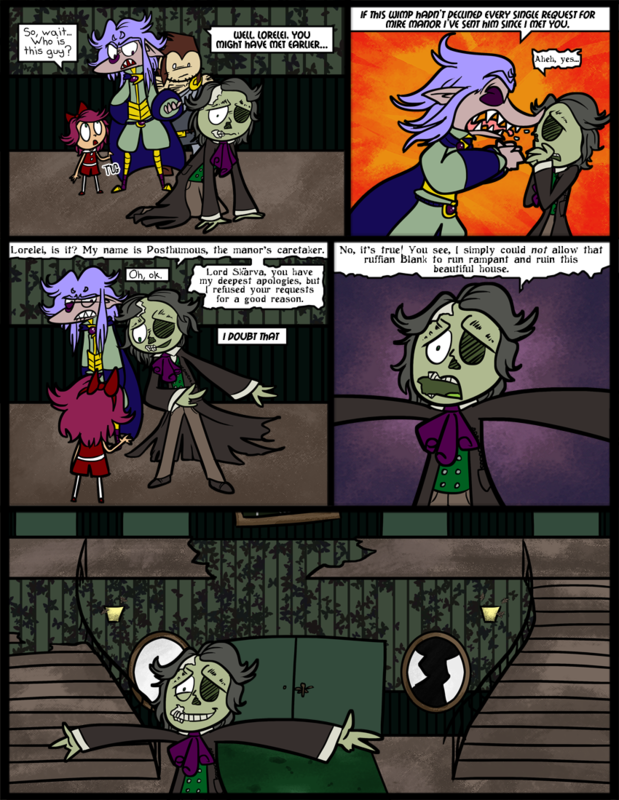 I can totally see what’s going on behind the last panel: “Lord Skarva is not amused.” You can’t win this argument, Posthumous, even if the house WAS in perfect shape. And about what you replied to my Sunday filler comment. Zoroark is skinny, has an evil feel to him, sharp teeth, dark magic powers, pointed face, and has awesome hair. What else do you need to know?? I agree with TheHangedMan about Electabuzz. Yay! I always liked Electabuzz and Elekid. That evolution of theirs can just stay far away from me, though. Why yes, mr. zombie, your house is indeed beautiful. Thank you very much! The weightier lines do make a big difference. It may be falling apart and rotting, but I still think it’s beautiful. Oh, the house, too. Its The Doctor. For sure. Hes just wearing a perception filter. And also tomorrow is my birthday. YAY. I jjust realized how awesome skarvas face is in the second framE CURLY FACE. He has his nose all up on dead body. That can’t be sanitary. He’s also spitting into Posti’s nose-hole. Skarva is getting better at letting people touch his cape isn’t he? Only if it’s Derk or Lorelei. That says something about how he feels about them. Which is good because he never bothers to say such things himself. Quit lying, Posthumous. You are not a good liar. I’m just going to call him Com Post. Because that is what he’ll be when Skärva is done with him. That last panel breaks my heart a bit. I have a nagging feeling this guy’s character is going to make me really sad in general, though. Also, this comic could be nothing but Skarva making faces at people and I’d still love every bit of it. He deserves an award or something. I know it’s a missing eye, but the way it’s shaded makes it look like an eye patch. Oscar Wilde defiantly? Oscar Wilde may have been defiant, but this guy isn’t. Thanks! We look forward to having you around! I wouldn’t find owning this place and giving it away to an unsuspecting plumber. And it’s definately option E.
Yes. Every single one all at once. It’s Posthumous! I know this guy!